Lucy joined CareTech plc’s Finance Department in 2013 and, since 2015, has been Senior Estates Administrator for the Central Region of CareTech Community Services Ltd. Lucy works very closely with the region’s services, ensuring that all homes are assisted with any emergency or routine works that need to be carried out. This involves working closely with homes across the region, ensuring that service users are a priority at all times. In addition to her professional role within the care sector, Lucy has additional experience of the care sector as a carer for an individual with mental health issues. Having experience of the care sector from within and without in this way provides Lucy with an invaluable perspective. Lucy was the recipient of the Overall National Winner of the Caretech Care Awards 2017. 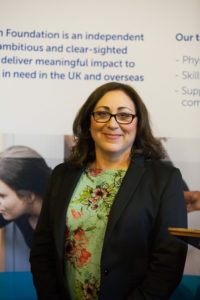 Lucy won several categories of the Awards and was recognised by the judges as the Overall Winner for her commitment and dedication to supporting her colleagues across the region, her “positive, person-centred approach” and for always putting service users’ needs first.